What, if you had more of it, would make things better? Time. I barely have enough to read this. Cold, hard, Cash. That is all. Just a bit of Recognition. Does anyone see me and what I’m doing? Anyone? Sheesh. How is it that not one doctor can tell me anything with any certainty? I need more Answers. I could use some Support over here, people! I used to have Joy. It’s apparently gone the way of my time and my lovin’. To be heard and known, and still somehow loved. Friendship would make it bearable. I live in a vicious cycle that always ends in me failing and giving up. I need Discipline. What, if you had to pick, is currently lacking in your life? What would make it all so much better right now? This post is for those of us who think more time would make things better. When there’s ‘no time’ or space to wonder and wander, creativity goes AWOL with joy. Without space for real listening and connection, friendships flounder. Sleep is elusive, and discipline is a dream. Lovin’? Fuhgeddaboudit. We become less leisurely with people – there’s just not time! Our rough rushing bruises the tender-hearted without us ever knowing or slowing. We miss all the small, the wounded, the soft-spoken, and the mystery. 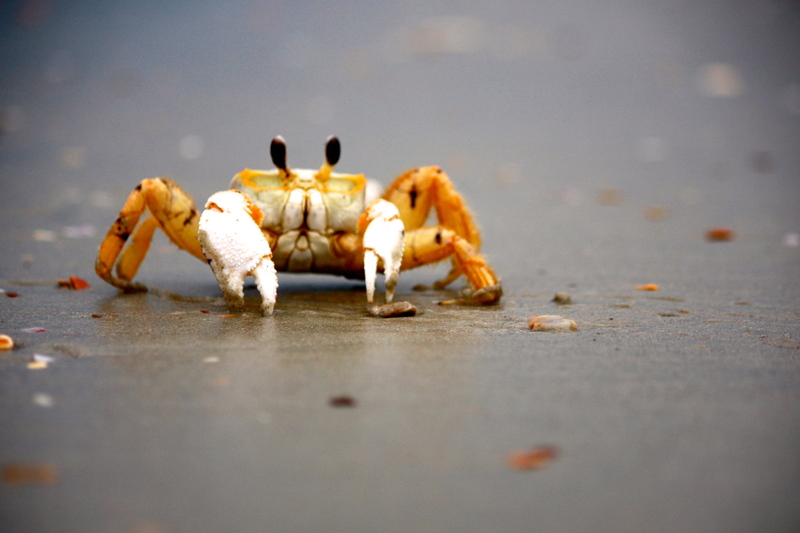 Have you ever watched a crab going about her morning? She spends a considerable amount of energy scurrying sideways up and down the sand, heading to a very important somewhere. She doesn’t have the time to mess around with you. Why are you in her way?!? Woe to the unlucky souls who threaten to interrupt her very important crabby business! The crab, friends, is me. And so, a public service reminder to myself and anyone still reading: This day is a grace. We didn’t earn today, and can’t possibly deserve it. Tomorrow is not owed us. Today – and everything in it – is a grace from God because it’s from Him for us. When did we forget that we are such desperately needy and dependent creatures? We rely on our Maker for everything. He enlivens us in every way. He has given us another day! Do not fear. There is enough time for you today. Who send the rains to fill the rivers, and summons the sun in its time? You know this! Whose voice is recognized by the sea and all the little children? Who knits a new life together in a mother’s womb? God does! Yes, in the perfect fullness of His time God breathes life into a body that will bear his image in the world. Wonder at this! God picked this exact time for you. A day, despite all our collective efforts to the contrary, is not something we control. We get the time we are graciously allotted, and our days are numbered. But you know what? The days we get – a little or a lot – are for our good, and the benefit of the world. Don’t be afraid. There is enough time for you today. AMAZINGLY, all that is asked of us in our days is that we know it is God who is in and through all things. When we thank Him for this day – this hour – we see ourselves rightly: we are not God! When we thank God, we give Him all credit for holding all the world’s needs, including mine, in His hands. There is enough time for you to say thank you. When we give God credit, we believe that he knows and keeps the world. If we trust that He sustains all the things, then we can believe He also cares for us. If we believe He keeps the world in HIs love, then we will hope with confidence that He will care for our bodies and souls forever. Receive the amazing grace of God’s time for you, instead of fearing the lack. This is His day, given to you because He loves you. Peace, because He is with you in your time. PS. Did you notice something special about this little crab?? See if you can find it! 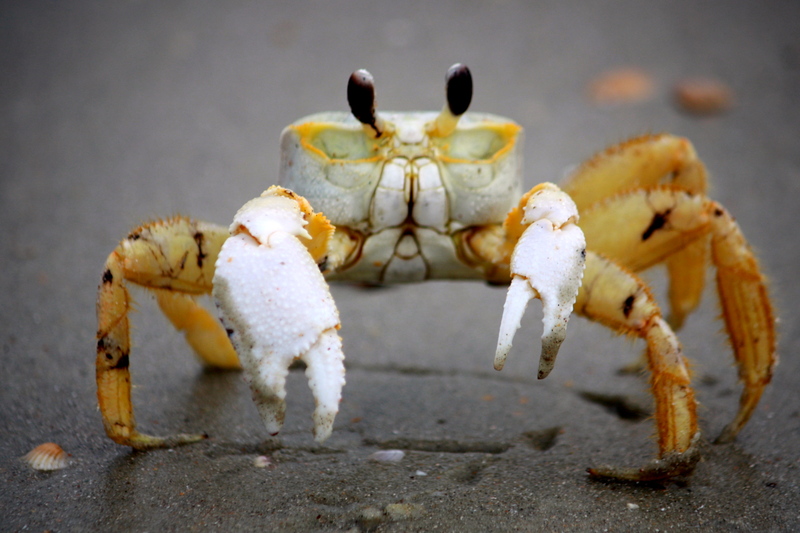 14 responses to Consider The Crab. I can’t seem to find anything special about this crab other than he is yellow but I really loved what you had to say. I have been doing a lot of rushing lately. It’s time to rest in the hurrying world. Is it missing a leg? I’m no expert, but it looks like there should be an extra one in the front there. Why do we think we are entitled to our day when it’s always a free gift from our Creator? Great post! This “little guy” only had two legs on one side of his body, compared to the three on the other. I sometimes focus on the things I am lacking and feel desparte for more time, talent, etc…. But I have been given by Grace all that I need for this day, for my tasks and for my ability to love others by the one who extends His grace to all. Indeed on all counts! Good eye! PS. You’ll have to look closer. Needed to read this article today. Sat with a momma today who lost her husband on Sunday. We talked about all that we needed to so, but felt so heavy. Thanks for the encouragement. Once again, the beauty of humility shines through your message. You must’ve slowed down long enough to notice this crab, and that on the side where she’s missing a leg, her front claw is much larger. Provision. I am grateful. Suzanne! That means you have been praying for me for a year! There is NOTHING that you could have written today that could have encouraged me more. Thank you, and may the LORD keep your family in his care so that many will see and know and abound in hope. Always enjoy your blog – such “timely” words. And so honest. thank you! Thank you for this piece of wisdom! Much needed today.